Bi-fold doors are currently the most popular doors on the market for bringing th e outdoors in, we have supplied and installed bi fold doors into many homes across Bedfordshire and every time the customer has been thrilled with the finished project. 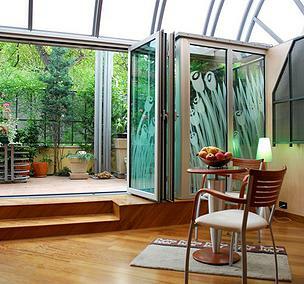 Bi-fold doors are also known as folding doors, simply put it’s a door that can fold in or out into a desired space. Here at iGlaze the most popular bi fold door is our aluminium range. Ridged, secure and smooth to operate. The doors come in a range of powder coated colour choices and have the option of our standard 28mm glass units or 36mm triple glazed. All our aluminium profile has an integrated thermal break, eliminating condensation. The doors have a multipoint locking system, like a conventional Upvc door; meaning your home won’t be susceptible to burglars. Each door when opened, glides smooth and free and are surprisingly light to operate. Bi folds are perfect for the back of a property. They let in lots of light and allow a panoramic view of your garden. Then, once opened, the inside of your home blends seamlessly with the outside, creating a smooth transition into the garden and the perfect space for modern living. Bi-fold doors offer amazing flexibility in their design and due to their simple tracking system that runs along the panels the bi-fold door is remarkably easy to use. Here at iGlaze we can offer PVC or aluminium bi-fold doors; we will sit with you and discuss the benefits of both so you can make the right decision for your home. – The iGlaze team are always happy to help!